Yes, I know, I was just in Japan last November, but there is something so mesmerizing about the land of the rising sun that I simply can’t resist its charms. To celebrate my birthday this year, I met up with my parents in Tokyo in May and we couldn’t have picked a better time to visit. 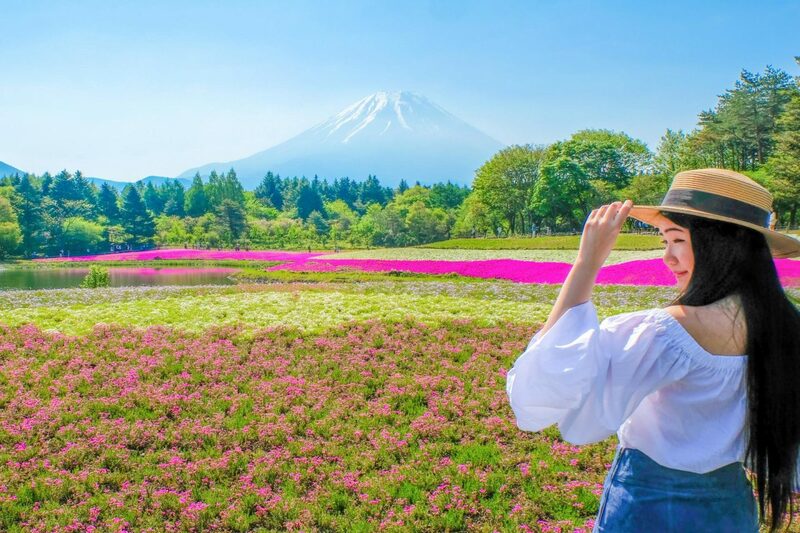 The Fuji Shibazakura Festival is an annual flower festival that takes place mid-April to end of May in Fujikawaguchiko, Japan. 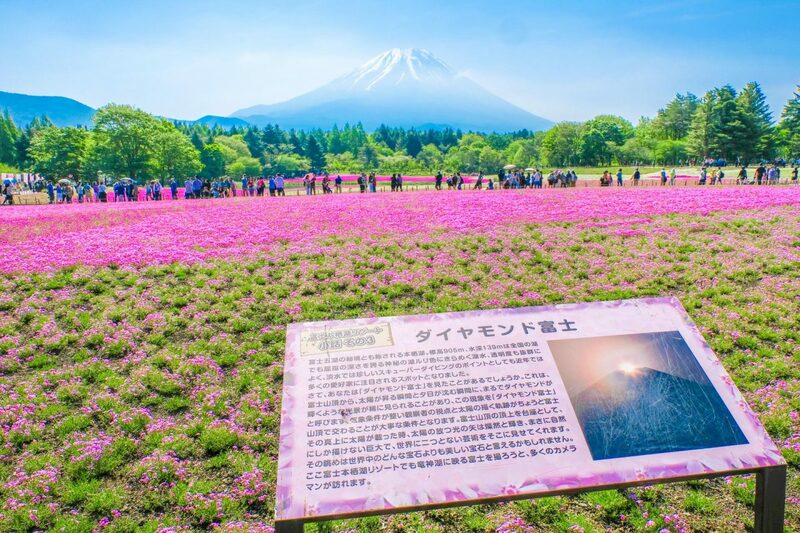 There are approximately 800,000 shibazakura (moss phlox or pink moss) that bloom at the base of Mt. 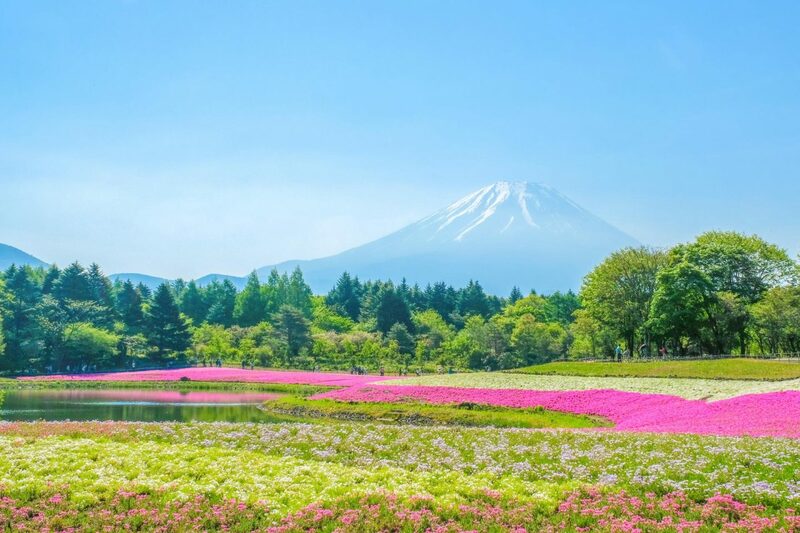 Fuji – thus making this a very popular destination for tourists and locals alike. The term “shibazakura” can be translated into English as “lawn cherry”. Its name came about from its resemblance to cherry blossoms. Moss phlox is also a creeper plant, meaning it covers the ground like a lawn. Tickets are 600 yen (~$7 CAD) per person for adults and 250 yen for children 3 or older. Parking on site costs 500 yen for standard vehicles, 2,000 yen for large vehicles, and 300 yen for motor bikes. However, I highly recommend taking shuttles. The lot can fill up pretty quickly. Also note that Japan is a left-hand traffic country. As someone from North America, it may be a quite a challenge getting used to. Car rentals in Japan aren’t particularly cheap either so save yourself the trouble and take public transit. We stayed at a hotel in Fujiyoshida just minutes from Kawaguchiko Station. That said, we were already in the area. For those planning to come from elsewhere further say Tokyo for example, Kawaguchiko Station is the nearest station to the festival. At the station, you can purchase shuttle tickets for the Shibazakura Liner. This takes you directly from the station to the festival with no stops in between (30 minutes give or take one way). Tickets are 2,000 yen (~$23 CAD) for adults and 1,000 yen for children ages 3-12. This includes round-trip transportation with admission to the festival. The park opens at 8am so we took the earliest shuttle at 7:50 and arrived around 8:20. Let me tell you, it was jam packed already. Usually I’d suggest early visits to avoid crowds, but definitely not the case here. I say if you have a pretty relaxed schedule, sleep in and take your time! 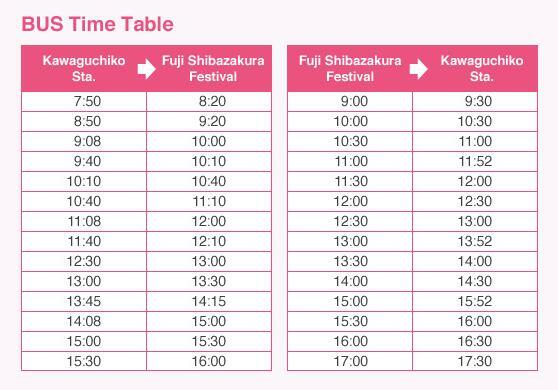 Below is a schedule of the Shibazakura Liner and more information can be found on the festival website. The park is quite big and walking shoes are preferred. The shuttle dropped us off at entrance #2, which I’d say is much closer to the main pink moss action. We looped around the Ryujin-ike Pond and at this point I was starting to get anxious that Mt. Fuji was nowhere to be seen. The skies were a bit hazy and naturally I thought we came on a bad day. 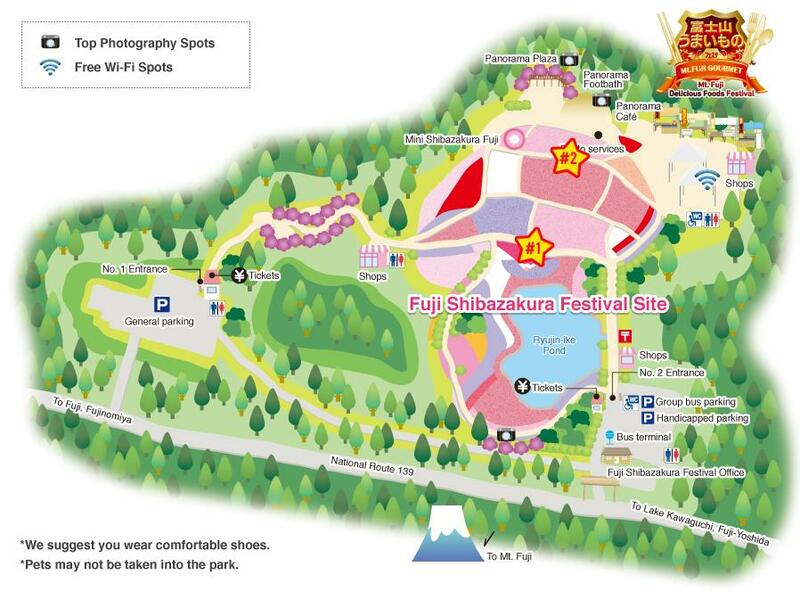 We obviously didn’t study the park map but I’ve labelled where I think the best views of Fuji-san are down below. When the sun’s so bright your small Asian eyes are non-existent. Here is where you really get that nice framing with the pop of pink against the blue Mt. Fuji. You still see the pond but compared to spot #1, taking photos here can be trickier since you get a lot of people moving in the background between paths. 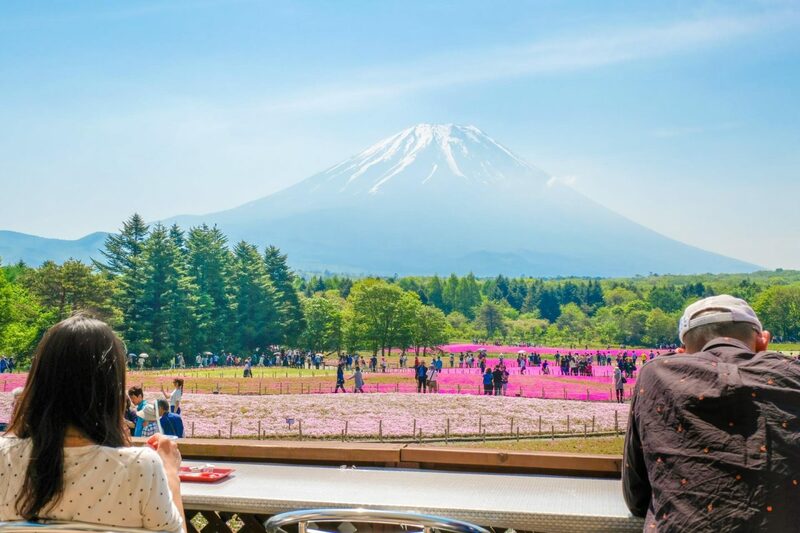 Aside from taking photos, I urge you to check out the Panorama Café where you can enjoy a little snack and sit and relax in front of this gorgeous scenery. And if you are hungry, there are food stands as well (more info here). 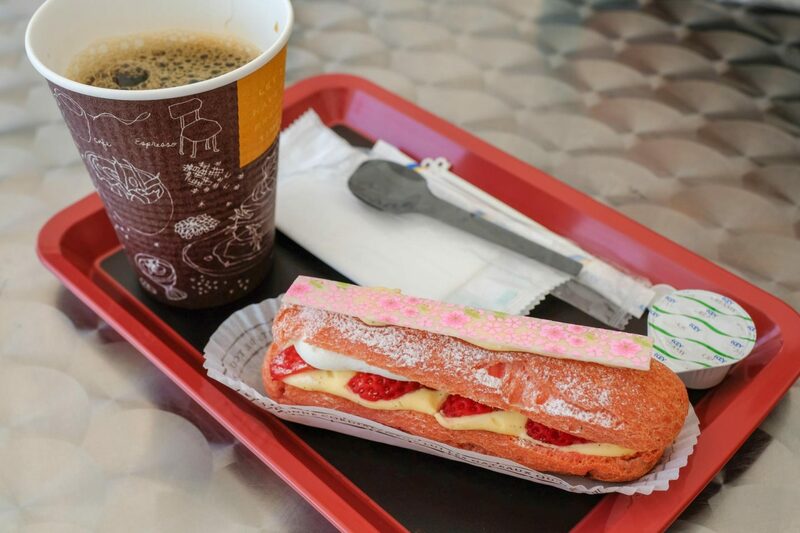 Also don’t forget that there are souvenir shops too located along the exit so you can grab some specialty treats on your way out and not have to worry about carrying them around the park. Now I myself have never heard about this festival until I was looking up things to do for my trip. Needless to say we were definitely vey lucky to have been able to make it and I strongly suggest paying a visit if you are in Japan in April/May. We only had about 4 days in Japan hence we were on a tight schedule but I’d say you need at least half a day here. There was the whole other side of the park near entrance 1 that we didn’t even get to explore and with festivals like this, you really need to take the leisure to stroll through the park and enjoy mother nature. Gonna concludes this week’s blog post with a couple more pictures. Don’t forget to sign up for newsletters and I will see you next Saturday! Wow I’ve been reading up on Japan for a trip next year and hadn’t seen anything about this festival! Your pictures are absolutely stunning, what incredible colours!! Oh my word! These photos are so pretty. Those flowers. WOW. Your outfit is adorable too. Absolutely incredible pictures and location! The brightness of colors just seems unreal! I guess this could be named Instagram photo spot Nr 1 of the year, I don’t remember seeing anything so pretty in a really long time. Good thing that you provide info about the public transport, as we once drove one of the Japanese cars (in Palau, actually), and even the information on the dash is in Japanese, so can be really hard to understand all the info, not just the driving bit! Thank you so much Alina! I’m entirely flattered by your kind words. I had actually wanted to rent a car but my parents were strongly against it. Super glad we didn’t. Can’t imagine what a struggle it must’ve been for you guys, yikes! Your photos are absolutely stunning. The backdrop of Mount Fuji really does it for me. Thank you for introducing me to a festival other than the cherry blossoms! Woah, this is so beautiful it’s unreal! I had to postpone this year’s trip to Japan, and am now kind of glad I did so that I can add this to the itenerary 🙂 Thanks for including all of the practicalities with transport & footwear, it really helps! Whoohoo that’s awesome Rosalie! Guess things turned out for the best. Hope these tips/suggestions can help for when you visit!! Great post! I’ve never heard of the Shibazakura, I’ll have to try and make a trip out next year. To be honest I haven’t gone much further than Tachikawa lol. I love your mani btw! Japan is always a good idea. Bring me with you!! Wow. Your pictures are amazing! I was supposed to go to Japan this spring to visit my nephew and we never made it over. We would have been there for this beautiful festival. I’m sad that we missed it now! Nice detail in your descriptions. I am adding this to my planning folder!!! Wow, this looks unreal! I would love to visit and see this festival myself. Thanks for the deep insight into your trip. Wow! The colors are just so vibrant. I have never heard of this festival before and I’m really surprised. Using public transport definitely sounds like a good idea. Definitely adding this to my list for Japan. Yay! Super glad I could inspire you to add this to your bucket list. Hope you’ll get to see it someday, Penny! Wow this is incredible! I’m definitely putting this on my list after seeing your amazing photos!! These photos are amazing! We visited Japan in November and with the fall colours it was beautiful, but this looks equally pretty. I had never heard of this festival but it looks so fun that I want to go now. Thanks for sharing this, it will definitely go on my bucket list. Lucky you! I’ve been to Japan so many times but still haven’t visited during autumn yet. Super glad I inspired you to put this on your list and hope you’ll get to see it in person someday!! Wow, I need to attend this festival!! I absolutely love the colours in your photos and Instagram feed. When I visited the Hakone area it was too cloudy to see Mount Fuji . Hopefully I can see it next time along with all the flowers in Shibazakura . Same! We visited Hakone after this and the first day we were there, Mt. Fuji was nowhere to be seen. Second day it showed its face but we were leaving already 🙁 Mt. Fuji is absolutely incredible and never gets old no matter where you view it. This is definitely a bucket list worthy spot! Those pictures are stunning! This really makes me want to go to Mt Fuji! I will have to go at this time of the year. What a colorful experience. This festival looks to be one of the best ever with those views. And of course there is food and souvenirs, which caps off the day perfect. Now I want to go to Mt. Fuji. One could easily spend a whole day here. Hope you’ll get to visit someday Sara!! Those colours! That pink! I don’t think I’ve seen anything like it. I would love to be surrounded by such vivid nature as this – once to add to the bucket list! Oh my goodness these flowers are so gorgeous! Your pictures are amazing. I had no idea that a festival like this existed but now I need to go! Thanks so much Kassie! I didn’t know about this festival until recently and it’s definitely a must if you ever visit Japan!! I’ve never even heard of this park. However, the lake with the reflection is just unreal! I love the bright pink flowers that surround it as well. It’s so affordable too, it would be impossible not to make a stop there! 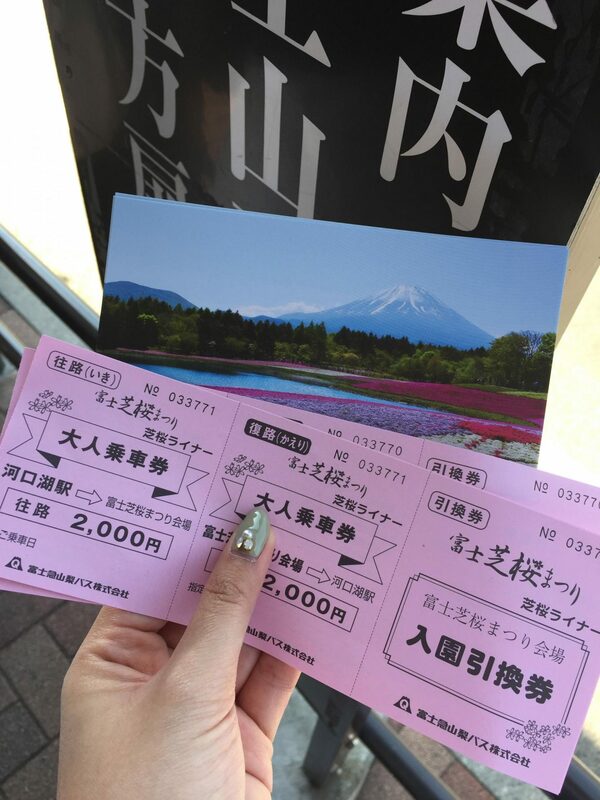 It’s definitely very affordable, just a bit far to get to but seeing those pink moss/flowers against the Mt. 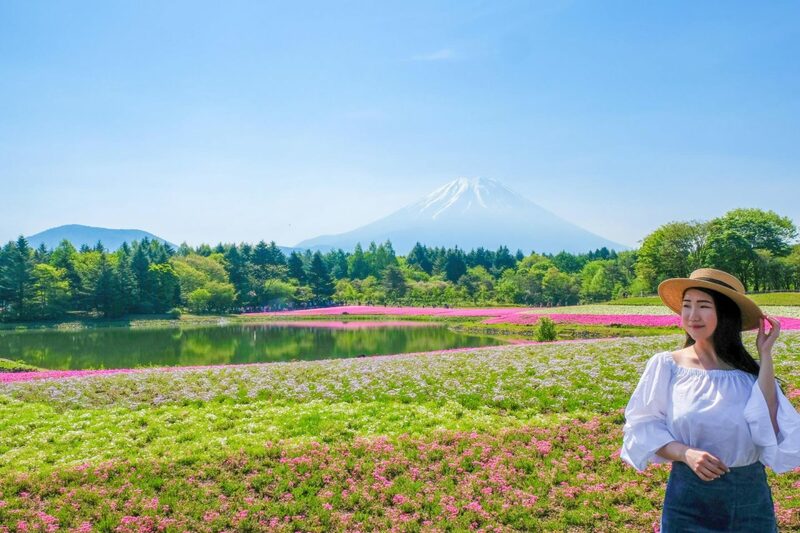 Fuji horizon is just an absolutely incredible scene that you HAVE to experience for yourself! What amazing photos! I had no idea this festival was even a thing and now I want to go so badly! Wow! The flowers and Mt. 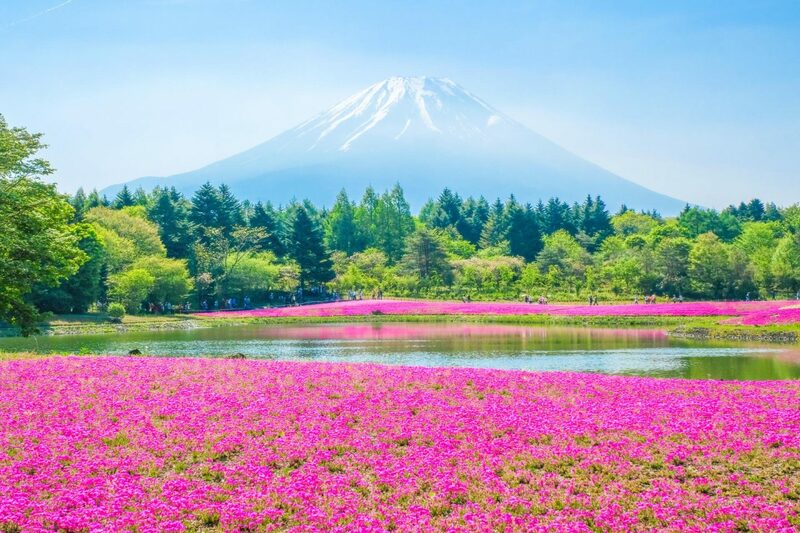 Fuji are stunning! Such beautiful pictures! I’d love to go to this festival. Lovely! Thanks Stacey!! 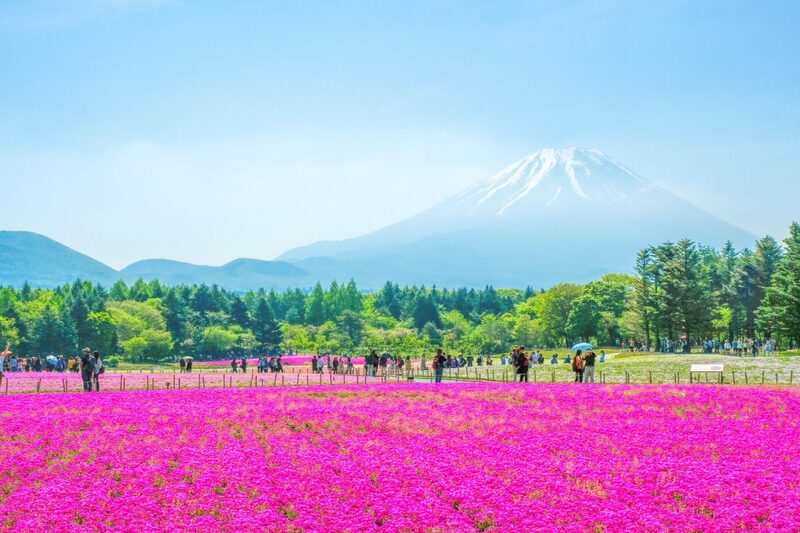 Definitely add it to your Japan bucket list, you won’t regret visiting! 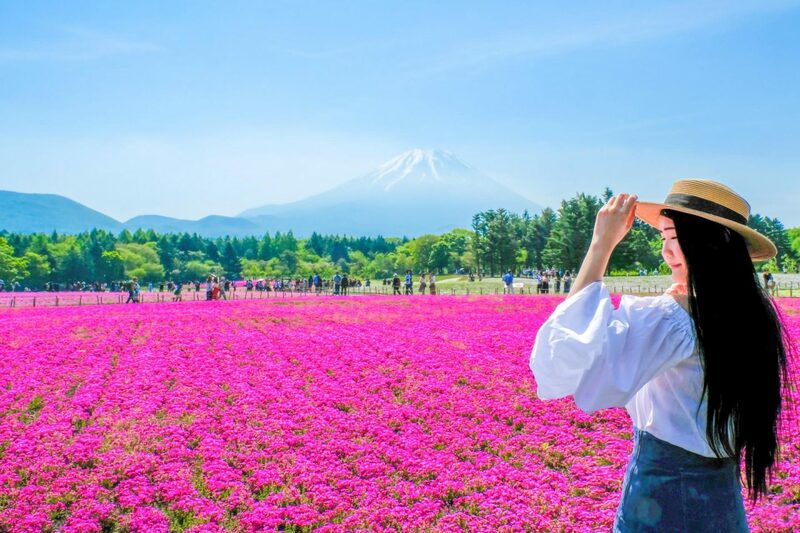 Visiting Japan is at the top my Son’s travel bucket list and after seeing your incredible photos, it’s got a spot on mine as well! I love festivals and often use them as an excuse to visit places around the world. They always showcase the best of a place and this festival is no exception. Great post, thanks so much for sharing! 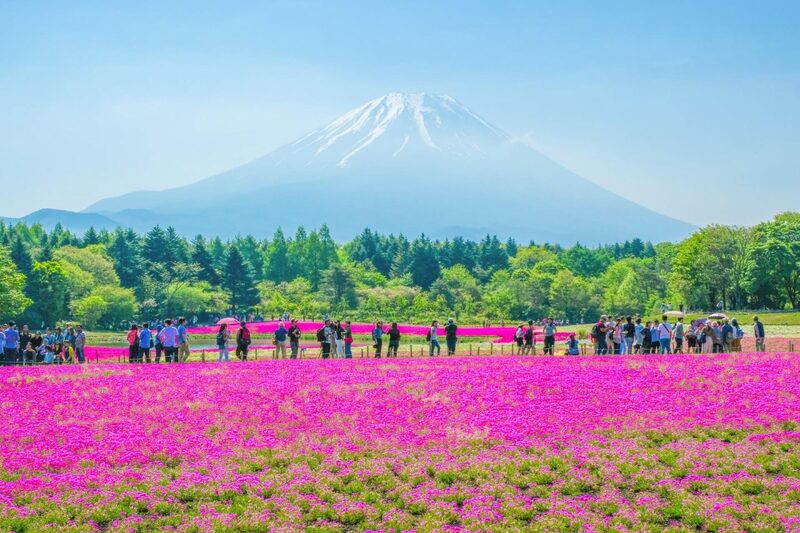 I will definitely add the Fuji Shibazakura Festival to our itinerary when we visit Japan!! Thanks so much for the kind words Tracey! Japan is no doubt a great destination for family trips. I myself have visited mostly with my parents and we love it. Hoping that you’ll get to visit someday soon!! WOW! 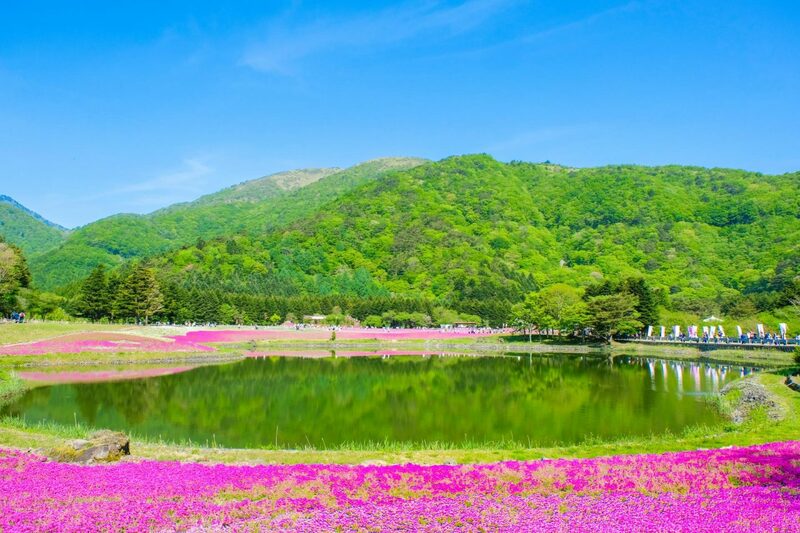 The pop of pink flowers in the scenery is amazing! Such fantastic photos and it sounds like such an amazing festival. WE were thinking of doing a ski trip in Japan next year but then seeing this now, seems like I would like to do something like this . 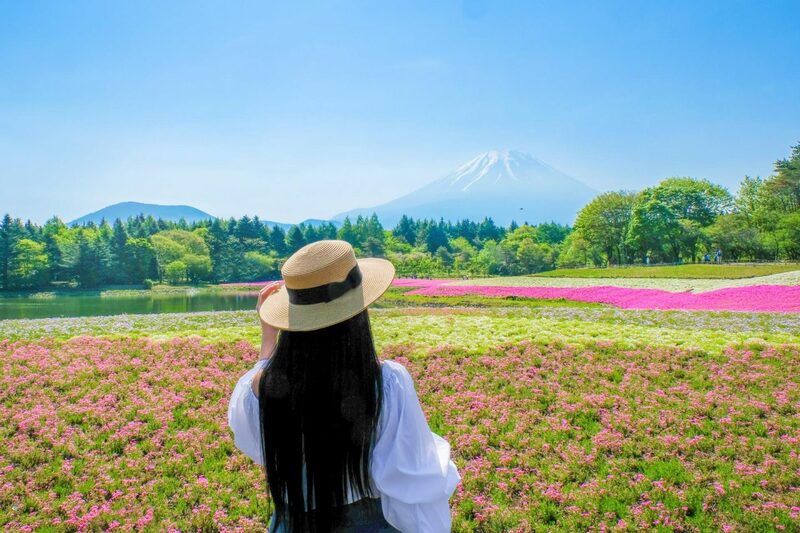 Aww tbh, it is one of my biggest dreams to spend an entire year in Japan so I can explore more beautiful places and fun activities throughout all four seasons! Waaaahhhh these photos are so pretty, it’s almost unreal! Man, I would so love to visit Japan some time soon! Oooo I’m so going to plan a trip there between April- May just to catch this after reading your post! It’s a flower fairyland and what’s better than this? Stunning photos! I had never heard of this festival and I wonder why. Is it not so popular? 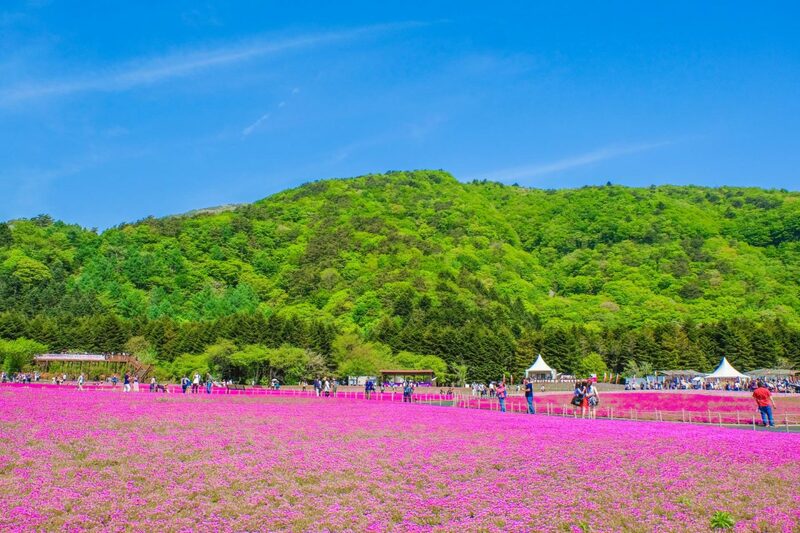 It sure is just amazing – the pink blossoms offset by the greens around it. Stunning indeed. I know I would love to visit here. Hello Fellow Canadian! WOW! your pictures are INCREDIBLE! Nice job. The festival looks incredible. I hope to get to Japan for the first time soon! Your photos are absolutely stunning! 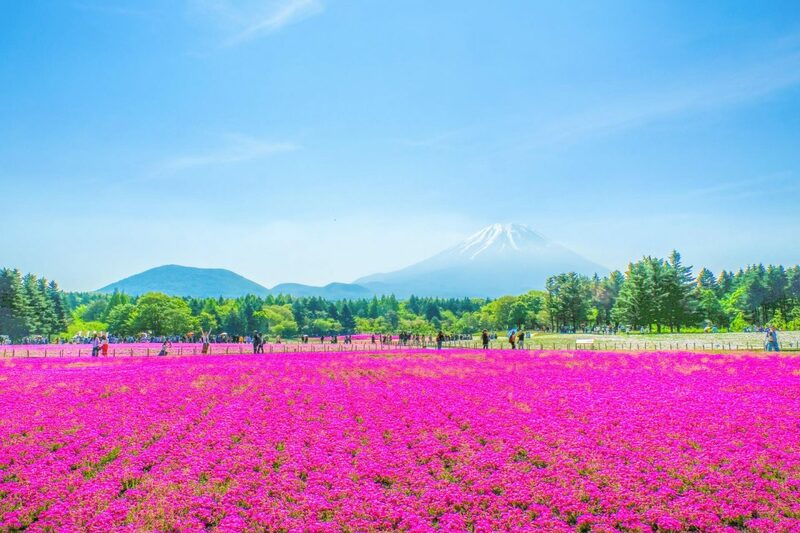 I’d love to visit Fuji Shibazakura Festival those pink flowers are gorgeous. It’s so pretty! Love the flowers! Never been to a festival like this before! It was my first time to something like this too. Super breathtaking!! Oh my gosh! That landscape and that beautiful pink are breathtaking!! This looks like it would be an amazing experience. Thank you for sharing it! These photos are incredibly beautiful! The sea of pink against the blue of the sky is marvelous! The scenery is just unbelievable and I’d never heard of this festival before, so thanks for sharing! Glad you enjoyed the post, Katherine. Happy weekend dear! wow your photos are amazing ! 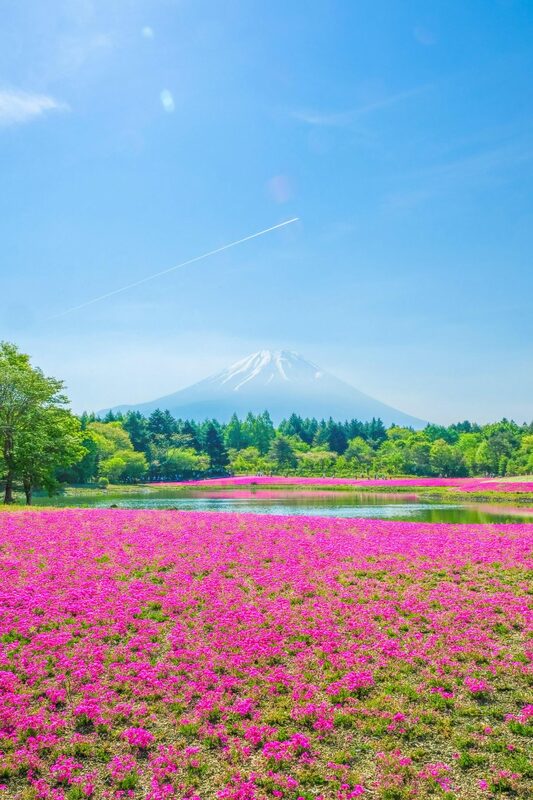 I LOVE those pink flowers and Mt. Fuji behind! That festival sounds fun! I am gonna visit Japan this year unfortunate only 3 days in Tokyo so I wont get to explore more of that beautiful country ! Aww maybe next time! There’s so much to do in Tokyo too, your’e gonna have a blast!!! Your pictures are incredible! 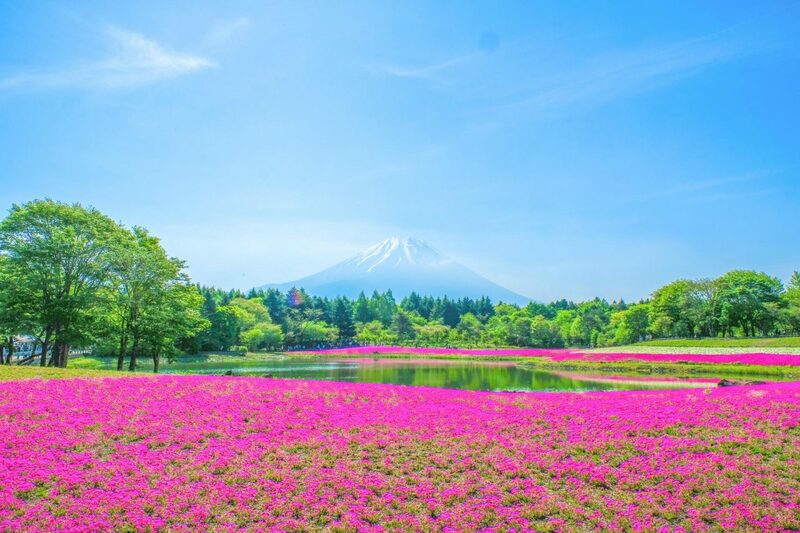 I love the way you captured the colors of the flowers and Mt. Fuji looming in the background. This sounds like a great festival. I wish I’d gotten to attend when I was in Japan years ago. I love all the flower festivities in Japan. 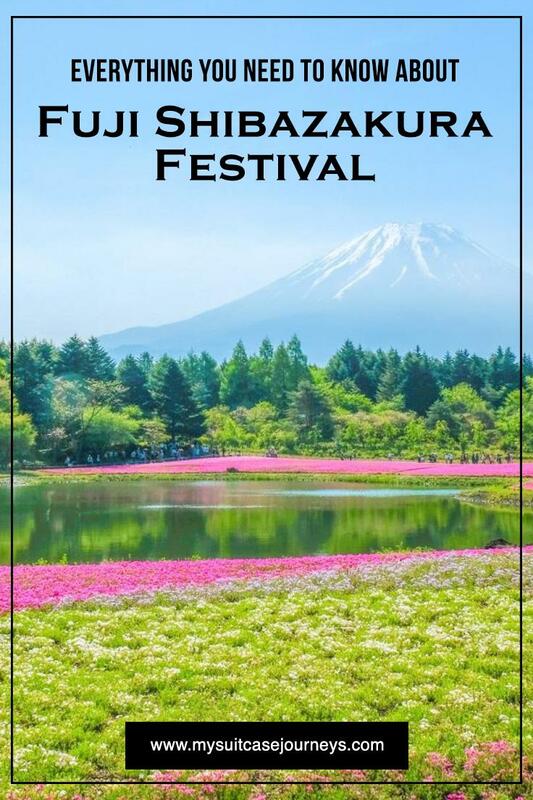 I didn’t know about this festival but will have to take the trip one day I love Japan to begin with and this just looks stunning!! Your photos looks so surreal, I love the contrast between the bright pink and the blue. And the fact that they are all at the base of mount Fuji it makes it even more special. I would love to see this in person. The aroma in the air must have been so pleasant from the perfume of the flowers. It’s definitely bucket list worthy and I think you’d love it there, Joanna! Funny thing tho it didn’t smell like anything much to be honest but probably because they were moss not really flowers. These pictures are absolutely stunning and you look so chic! I had no idea this festival existed. Can’t wait to make it there someday! WOW!! Those pictures are amazing! I can’t believe how pink it is. This would be a great festival to attend. How fun! Thanks so much Kimberly! And I know right!! I didn’t even turn up the saturation and the pink was already so vivid! Jasmine!!! I finally got a chance to stumble upon your blog! And omg the photos are amazing! 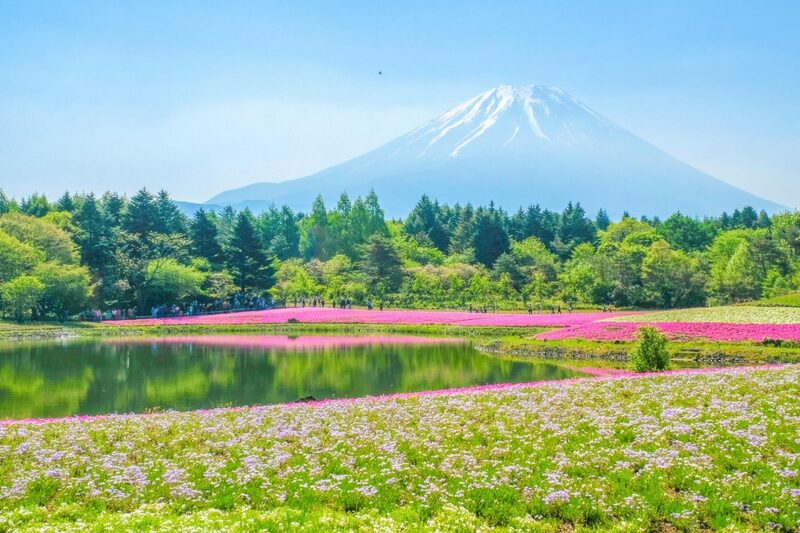 I have yet to make it to Japan during the spring time – I’ve only gone during Summer and Fall/Winter – but this is def on my bucket list! Thank you for sharing! Hi Jin!!! Thanks so much for your kind words! <3 Sometimes I wish I could spend a whole year in Japan just to experience its four seasons. So very beautiful. After visiting Japan twice, I need to return to attend festivals and this would be high on my list. Oh my gosh, these colours are absolutely unreal! 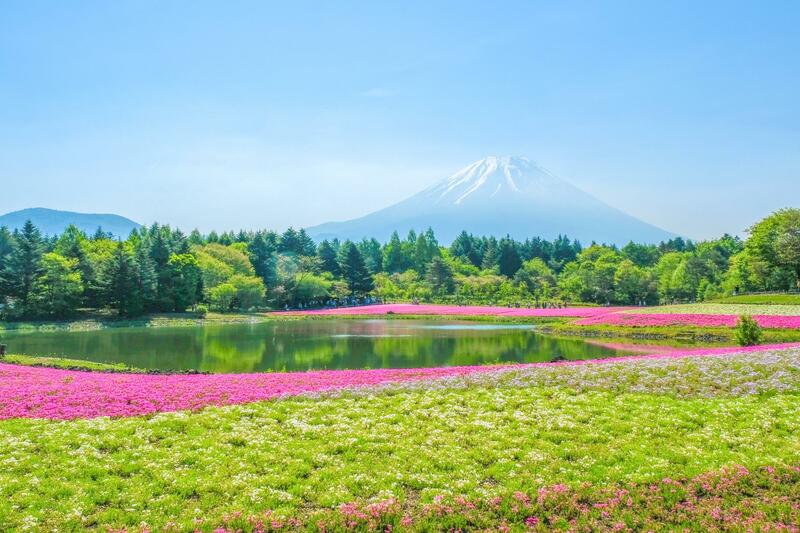 I love Japan – so much fascinating culture and incredible landscape, a truly beautiful country. I’ll have to add this to my list for future visits! Thanks for sharing. Glad to hear I’ve inspired you to visit! After this trip, Japan has honestly become my favorite destination. This looks surreal! Amazing place I must admit! I haven’t been yet to Japan, but of course, now I put it on my bucket list. Did you go to Keukenhof in Netherlands? 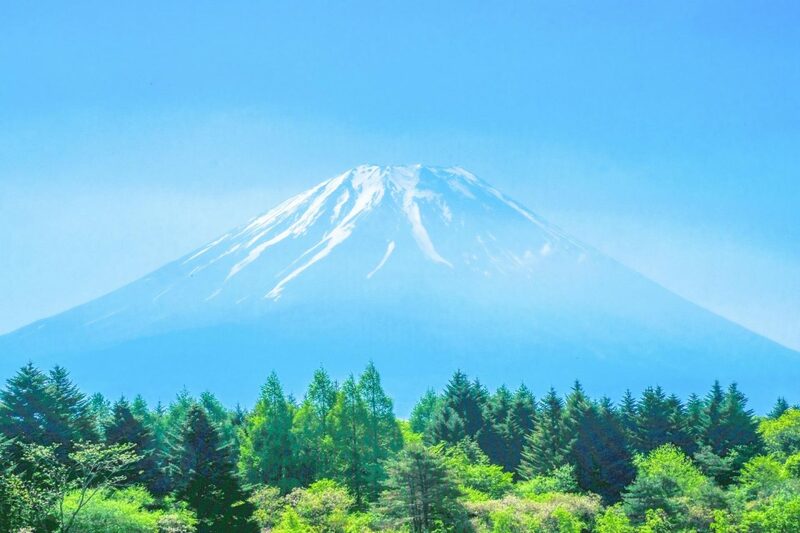 wow you had such a great view of Fuji! Clear day! I went to Japan and Fuji in 2013, in early april we must have just missed this! Found you from #TraveTuesday link up! So pretty pretty!!! i always love your pics – the colours are so sweet and happy! Your images are absolutely incredible! Mt. 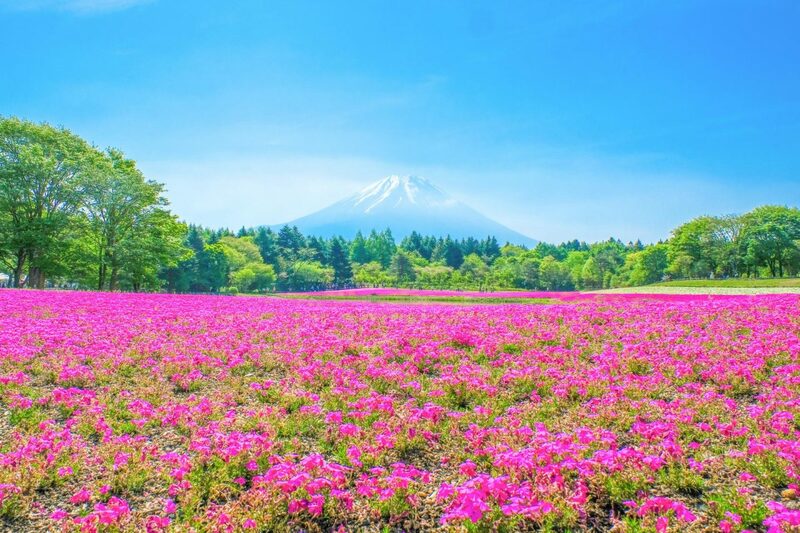 Fuji really pops and I LOVE all that gorgeous pink! I would love to visit this festival and see Mt. Fuji with my own eyes. Thanks for the kind words Melanie! I highly recommend the festival, you won’t regret it!!! Japan’s culture and landscape is so rich. I love the green and pink garden. Visiting Japan has been a dream for me but time hasn’t been on my side. I’d be sure to spend a year when I visit so I can explore the country to some bits. Since Fuji Shibazakura is yearly, I’m believing I’d experience it. 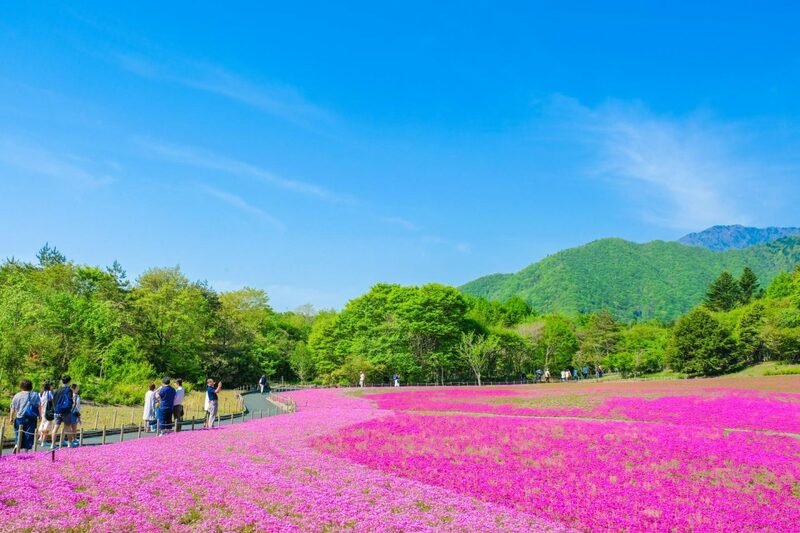 Although I’m from Shizuoka I had no idea this place existed, and I really hope I can visit here in near future. It always makes me happy to see how much you love Japan, and I fell so grateful to connect with you! Oh my god, these photos are absolutely incredible! I can’t get over how vibrant the pink is! 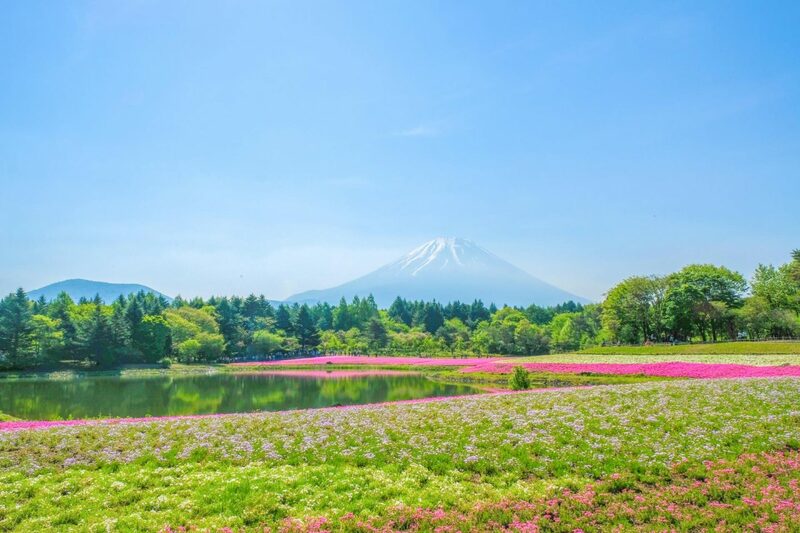 Japan is so high on my wishlist right now and this post hasn’t dulled that wanderlust! hi..im ezwan from malaysia..me and my wife planning to Shibazakura Festival on 18 April 2018(last minute trip)..
my question is do what is your recommendation for us either to book early online or buy on the spot ticket to the festival at the bus station(sibazakura liner)? Hi Ezwan! I’m so sorry I’m only seeing your comment today… We purchased our tickets in the morning on the day of and was fine (in terms of lining up and not having tickets sell out). Please feel free to shoot me an e-mail next time if you ever have any other questions (as I check my e-mail much more often) and my apologies once again I couldn’t get to your question in time. Hope you had a fantastic trip nonetheless!! What spectacular colours! Japan is high on my list, and I really hope to see this festival one day soon. I won’t attempt to spell the name, but Mount Fuji in the distance is stunning, and I’m sure it’s hard to take bad photos here. A really great post and fantastic photos too. I was in Japan in May as well and I went for the Shibazakura Festival at Mt Fuji as well! It wasn’t planned around it, I only realised the festival was on when I got there. 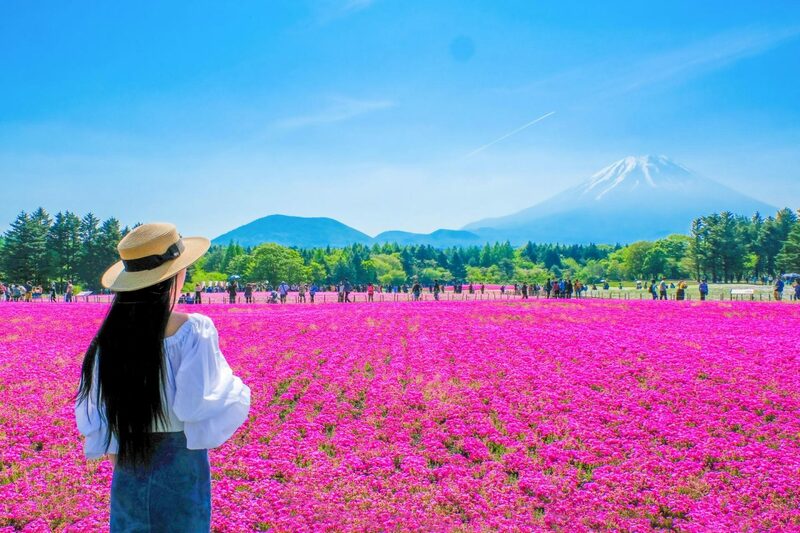 The traffic was a big mess and I ended up spending ALL my time in getting here (I had only the day) so I missed out on all other attractions near Mt Fuji which was disappointing but to be honest, the festival itself was so amazing, the flowers, the views, that I guess it was worth it 🙂 I love your pictures, it was a nice and sunny day for you and I can see that you were lucky with very clear views of Mt Fuji because many times, the peak is surrounded with clouds and you might not get such great views. I am speechless. This looks amazing. Looks incredible. Beautiful and stunning photos. Thanks for sharing such an amazing article.